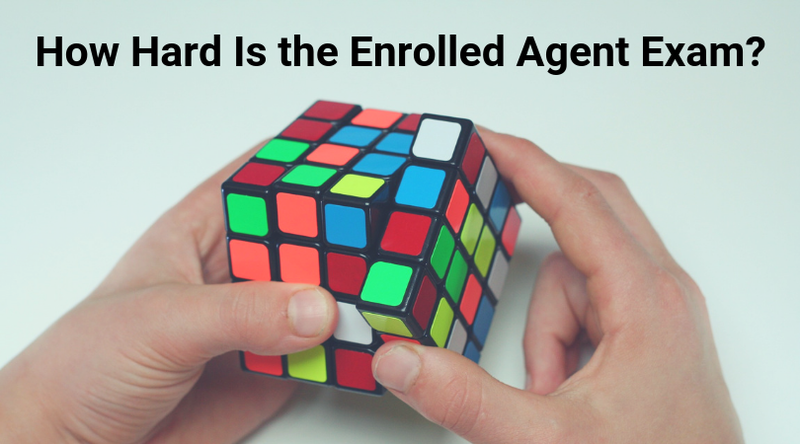 How hard is the Enrolled Agent exam? For EA exam candidates with major commitments to work and family, knowing the difficulty level of the EA exam (officially known as the IRS Special Enrollment Exam (SEE)) is very important. Truthfully, this is a rather subjective question. However, I have taken specific steps so I can provide an objective analysis. As a result, I can help you prepare effectively for the EA exam. Which EA Exam Part Is the Hardest? Enrolled Agent Exam Difficulty: How Long to Study for the Enrolled Agent Exam? The U.S. CPA Exam has 4 parts covering a wide variety of subjects, including financial accounting, audit, taxation, business law, ethics, strategic planning, corporate finance, IT, and economics. These exam tests these subjects at the introductory level. However, given the breadth of coverage, preparing for and passing all 4 parts takes a lot of time. Roughly speaking, the average candidate spends 300-400 hours studying for the CPA Exam. The U.S. CMA exam has 2 parts. The exam covers costing accounting, audit, corporate finance, and financial management at a deeper level than the CPA Exam. Having said that, the coverage is otherwise much narrower given its management accounting niche. Therefore, studying for the CMA exam takes less time than studying for the CPA Exam. The IMA suggests candidates study for at least 150 hours for each exam part. Consequently, the total study time for the entire CMA exam comes to around 300 hours. CPA exam is a mile wide and an inch deep. The EA was only a quarter mile wide but a lot deeper. The EA exam focuses on the niche of federal taxation. It delves very deeply into this subject matter by touching upon individual and business tax along with matters of representation. Unlike with the CPA Exam, you don’t need extensive knowledge of business and accounting to pass the EA exam. One review course provider tells their EA candidates to budget about 50 study hours for Part 1, 40 hours for Part 3, and 85 hours for Part 2. Most candidates find that studying for 2-3 hours a night for about a month is sufficient for passing the EA exam. We also cover how much time you will likely need to pass the EA exam. Enrolled Agent Exam Pass Rate: How Hard Is the Enrolled Agent Exam? As the average Enrolled Agent exam pass rate is 71%, many people find the EA exam to be easier than the CPA Exam or CMA exam. The overall U.S. CPA Exam pass rate is around 50%. The CMA exam pass rate is lower, at 35% for Part 1 and 50% for Part 2. Many factors influence the pass rates of professional accounting certification exams. For example, if the state boards of accountancy didn’t require all CPA Exam candidates to have an accounting degree or equivalent, the CPA Exam pass rates could be lower. They could also drop if the state boards did away with mandatory courses in audit and tax. However, what we learn from the EA exam pass rates is that candidates who prepare properly have the best chance at EA exam success. Enrolled Agent Feedback: How Hard Is It to Become an Enrolled Agent? Conveniently, I have a few readers who are both CPAs and enrolled agents. When these readers compared the CPA REG exam section to the EA exam, most of them agreed that the EA exam went deeper into the material. But they also found that the EA exam questions were more straightforward. REG, on the other hand, has trickier multiple-choice questions (MCQs) and the dreaded task-based simulations (TBSs), which are case study-like questions. On the EA exam, candidates have 3.5 hours to answer 100 MCQs. In contrast, the REG exam requires candidates to complete 76 MCQs and 8 TBSs within 4 hours. The EA exam dedicates a bit more attention to limits, phase-outs, and income brackets. Therefore, the EA exam is not extremely difficult. Rather, it is just different than the CPA Exam. If you think of tax law as a lot of rules, exceptions to the rules, and exceptions to the exceptions, then you can expect a lot of the EA exam to focus on exceptions. For this reason, the EA exam doesn’t really have trick questions per se. Rather, it simply demands that you know the content thoroughly. Enrolled Agent Exam Difficulty: Which EA Exam Part Is Hardest? Some of you may wonder which part of the EA exam is the most difficult. To make this determination, you could combine feedback from others with your own familiarity with the content of each exam part. Additionally, you could consult the enrolled agent exam pass rates to infer which EA exam part is the hardest. Until very recently, Part 2 had the lowest EA exam pass rates. However, in 2016-2017, the EA exam Part 1 pass rates officially dipped below those of Part 2. Part 1’s pass rates have stayed at the bottom of the pack for the last few years, but it’s probably too soon to assume the switch is set in stone. What does seem to be a sure thing, as it has been the case for 10 years now, is that EA exam Part 3 has the highest pass rates. My Conclusion: How Hard Is the EA Exam? Preparing for the EA exam takes less time than preparing for the CPA and CMA exams. Though the exam content goes deep, it is pretty much confined to the tax code. All 3 sections of the EA exam have pass rates higher than 50%, which is above average for accounting certification exams. While this is all good news, none of it suggests that you should take the EA exam lightly. Your goal is not just to pass the exam eventually, but to pass it effectively (i.e., on your first try). So, now that you know about the enrolled agent pass rate, you can begin to strategize becoming an EA. Next, it’s time to start thinking about your enrolled agent exam prep. To help you manage the enrolled agent exam difficulty and increase your chance of EA exam success, I’ve created my free EA e-course. Sign up today to learn more about how hard the exam is and how easily you can pass it.